* Build 486 of Command has been released and resolves the aircraft fuel problems reported on the last two public releases, plus other additions and improvements. Get it HERE. The amount of content provided with the game is baffling. I was blown away by the amount of details, customization to our fleet, how I could control every aspect of the scenario without ever feeling overwhelmed. That was mostly due to how the user interface works. Sure, it still needs some work when assigning missions but overall it was a pleasant surprise. Last, but not least, community help and how Warfare Sims handles it. Tons of new scenarios in a matter of months! New database stuff, its amazing! 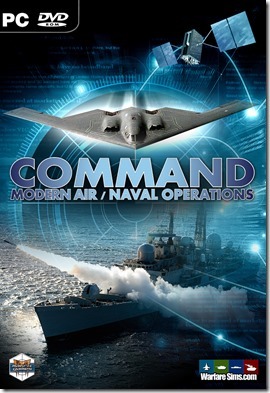 Overall, Command Modern Air Naval Operations is one of those games that I will pick up five or ten years from now and it will still be awesome to play. Definitely one of the best strategy / wargames released in 2013. Steven Lohr (CV60) has released updated versions of the DB3000 & CWDB image packs (the DB3000 now has over 7000 images!). You can download both packs on the Command downloads page. Baloogan has started putting together a site listing the DB3000 & CWDB entries. This is useful for quickly looking up the stats of a platform or component without having to use the in-game DB-viewer (or examining the “raw” database).